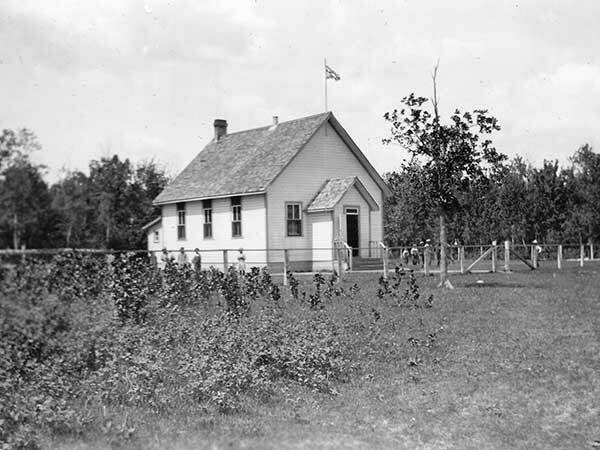 The Peguis School District was established in June 1907 and a one-room schoolhouse operated on Lot 86 in the Parish of St. Peter, in the Rural Municipality of St. Andrews. With growing student enrollment in the district, a second building was constructed in the southern part of the area, and named Margaret Hayworth School. The school closed in 1967 and the building was sold several times then eventually torn down. Among the teachers who worked at Peguis School through the years were Mary I. Currie (1907-1908), Gwen Overton (1908), George Branigan (1909-1910), K. W. Smith (1909-1910), Frank A. Eagerly (1910-1912), Alex Cowan (1912-1920, 1921-1923), Anna Steele (1920-1921), Irene Spratt (1920-1921), H. G. Nordin (1923-1925), Ethel Neilson (1925-1926), M. Blight (1925-1927), H. Dalgren (1926-1927), Rose Shline (1927-1928), F. C. Saunders (1927-1928), B. Frank Privat (1928-1929), J. B. Peterkin (1929-1930),o D. Fyles (1930-1934), John E. Harriot (1934-1938), Miss Stone (1938-1939), I. Dawson (1939-1940), T. Oliver (1939-1940), Edna M. Allen (1939-1940), Gordon R. Fines (1940-1941), G. M. Woolsey (1941-1942), G. McKenzie (1941-1942), M. Barnett (1942-1944), Lorna Orvis (1944-1945), L. Reil (1944-1945), E. E. Reimer (1945-1946), Paul Sigurdson (1946-1947), V. M. McKay (1946-1947), M. D. Cathers (1947-1948), Miss Sawchuk (1948-1949), Anna McNally (1949-1950), J. Freison (1950-1951), Miss Boresky (1951-1952), Miss Brodie (1951-1952), Mrs. Wakeman (1951-1952), E. Evans (1952-1953), M. Milne (1952-1953), Miss E. McKay (1952-1953), P. G. Kehler (1952-1953), G. McKenzie (1953-1956), Mrs. Southern (1957), G. Wakeman (1957-1959), Miss A. Mizgiel (1959-1962), L. Dronzek (1962-1964), Leonard Dueck (1964-1966), and Ian Barron (1966-1967). Beyond the Gates of Lower Fort Gary 1880-1981 - R.M. of St. Andrews by the Municipality of St. Andrews, 1982.